I felt bad about this. So I made sure to answer this. And whaddya know? : they like me, they really like me! Hey, Dave, look what you got! Congratulations, you’ve got a best answer and 10 extra points! Who will win in 2008 and why (real answers)? Go ahead, do your victory dance. Celebrate a little. Brag a little. Then come back and answer a few more questions! Thanks for sharing what you know and making someone’s day. So now I’m 1 for 1! I can see how this gets addictive. It does get addictive. The same thing happened to me the first time I answered a question at LinkedIn. Strangely enough, it was virtually the same question and I answered it pretty much the same way, too. > it was virtually the same question and I answered it pretty much the same way, too. Funny! Apparently we’re both preaching the same gospel. One way to create an information reward for users would be to make level rooms. Anyone can read questions and answers in those rooms but only users with the required level can post questions and answers. Free for Yahoo! to provide but worth quite a bit (answer focus and quality, etc.) for the user base. I believe that if the current actions of both parties continue, Republicans will win. There are roughly the same amount of people on both sides, who will vote for their party, no matter what. They are showing signs of pandering to the far left of their party.So I can,t answer But I tried to comment it. Strange? 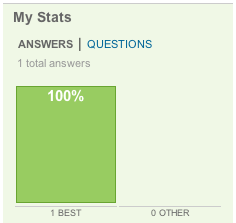 You answer, then get rated as best answer, but if there is too many best answer, you might get all your post deleted. I was posting answers about movies sites & music sites using this site links http://www.wiibeez.com/movies.htm & …/music.htm ; as this site is a powerfull multiple sites search engines, I’ve got 90% best answers… untill all my post was deleted? Isn’t the issue to give good answer to peoples at yahoo answers??? Can you be blamed to get 90% best answers rating?? ?